As the writer of this history of the family, I must tell something of myself and how I came to do this. Firstly I had my initial schooling at home doing it by correspondence as did all the family. In 1930 my parents sent me to stay with my Aunt Mary in Moree so that I experienced life in a school, then in 1937, off to Sydney Church of England Grammer School (Shore) where I was to spend the next three years as a boarder in Hodges House. I obtained my Intermediate Certificate in 1939 and also was awarded school colours for football. I returned home and spent 1940 swinging an axe cutting scrub for the stock. In March 1942 I was accepted in the Air Force as a reserve and was finally enlisted in October, 1942. I did my training at Bradfield Park, Narromine, and then went to Calgary in Canada to train as a Wireless Operator/Air Gunner and completed my training at Moss bank. It was then on to England for more training. Brighton, Padgate near Manchester, Whitley Bay near Newcastle and Llanduroc near Carnarvon were the various places I was stationed at before being sent to the Middle East and finally back to Australia to be discharged at the cessation of hostilities in the Pacific. It was whilst stationed at Padgate that I met the girl I was to marry. For me, my service life was virtually a world tour arriving in each area just when I was no longer needed. It was during this early part of my life that the seed was sown to start this work. On a number of occasions, instances came to light of family members being identified as other Burlings, of whom we had no knowledge and this set me wondering if there was any connection but it was to be quite a few years till the seed finally germinated and I started doing some research but due to lack of finance and pressure of work, progress was very slow. In 1966 as a result of the 1965 drought it became necessary for my family to move so that those reaching High School could proceed with their education and we moved to Bingara. During the years in Boomi I was active in most things in the district holding various offices in the cricket club finally serving as president for a number of years, President of the Barwon District Cricket Association for a term. Secretary of Boomi Diggers Race Club (being granted life membership in 1967), a trustee for the R.S.L. sub branch and also the Recreation Grounds Trust. I also served as joint secretary of the tennis club and was a member of the Graziers Association, having terms as secretary and president of the local branch and a District Councillor. In 1945, was appointed a warden of the Anglican Church and except for a short period in 1951 held that position till resigning in 1965. Barbara and I were both active in the P and C at Boomi, Barbara being treasurer for a number of years and I was chairman at the time of leaving. Whilst in Bingara I was president of the Bingara Cricket Club, treasurer of the parochial council of the Anglican church and the R.S.L. sub branch. In 1970, Bingara High School was down graded to Central School status and with two children needing to get their Higher School Certificates, we moved to Inverell in 1971. As l was on "compo", the result of an accident, it was necessary for Barbara to go back to work in order to pay our way. She was successful in getting work teaching at St. Mary's Catholic School. When the school was combined with Holy Trinity, Barbara moved there also but in 1976 with reorganisation within the school system she was to lose her job. Over the years from 1971 till 1982 we lived in various places in the district, then in October, 1982, we were able to buy our own home in Urabatta Street, Inverell where we now reside. 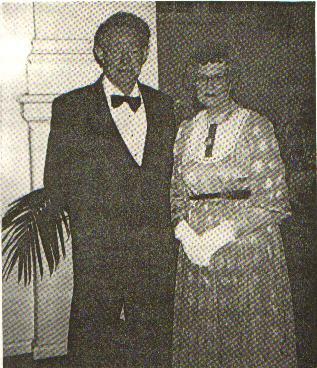 In 1974 Barbara and I started teaching old time dancing at Elsmore and were joined by a friend, Merv Williamson, an association that was to last six years. 1981 saw us start on our own and we are still doing this, raising money for local charities. I want to say thanks to all those people, relations and others who have assisted me in compiling all this information, especially to Merv Williamson, who started me on the right track and Pauline Paterson, a distant relation, who has given me much assistance in the research. Also to Barbara and the members of my own family for their help and encouragement without which I would probably have given up long ago. Another one I wish to thank for research on my behalf, Mrs. Margaret Bone of Cambridge, England who researched the early family in England for me. A special thanks to my sons Bob and Peter for the hours of work they spent preparing the manuscripts of this book ready for publication.